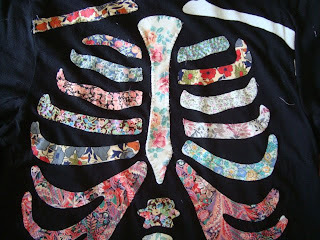 A few months ago I decided to make a skeleton T-shirt that was weird in some way other than the obvious, I wanted to add details that clashed with expectation, and would appear differently when viewed up close. My mum had recently given me her original 1970's Liberty Tana Lawn collection , some pieces were as big as a metre and some as small as tiny scraps, and I thought this project would be a great way to show off all of these beautiful prints in an original way. 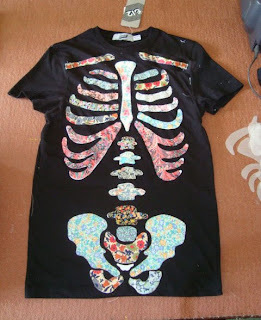 So - I found a classic skeleton t-shirt that had been printed with a white design onto black jersey, and got some tracing paper and a pencil and carefully traced off each piece of the design, numbering each part as I went along and then cutting them out and organising into left, right and centre pieces. 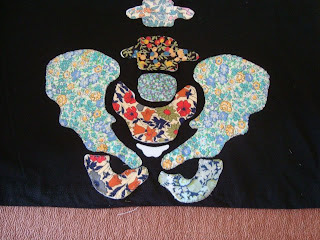 Then I selected a different piece/pattern of Tana lawn for each pattern piece of the design, cut it out and then pinned it onto the corresponding place on the design. I tacked them all in place with a needle and white thread so that they wouldnt shift about when I was sewing them to the t-shirt. Here are a few pics of the t-shirt in progress I will try and post some detail and finished shots soon.